A Prunus domestica L. cultivar. ‘Branches downy. Fruit regularly oval, with a very obscure suture just at the stalk, where it is rather deep, about one inch and three quarters long, and one inch and five eighths in diameter. Stalk three quarters of an inch long, slightly pubescent. Skin dull yellow, broken a little with green, assuming an orange cast on the sunny side, with a purplish bloom, and more or less mottled with crimson dots. Flesh yellow, firm, very sweet and luscious, separating freely from the stone. Stone oval, acute at each end, wrinkled all over, and nearly even at the edges. Ripe in September.’ [George Lindley – Orchard Guide p.466/1831]. ‘The origin of this variety is remarkable. The parent tree was purchased in the market of New York, sometime in the end of the last century. It remained barren several years, till, during a violent thunder-storm, the whole trunk was struck to the earth and destroyed. The root afterwards threw up a number of vigorous shoots, all of which were allowed to remain, and finally produced fruit. It is therefore to be presumed, that the stock of the barren kind was the parent of this. Trees were sent to Robert Barclay, Esq. of Bury Hill, in 1819; and in 1821 several others were presented to the Horticultural Society by Dr. Hosack.’ [PM t.16/1828]. ‘There are two accounts of the origin of this variety. William Prince gives its history as follows: "It has always been the custom at the establishment of the author, at Flushing, to plant annually the seeds of the finest fruits, for the purpose of originating new varieties; and, about the year 1790, his father planted the pits of twenty-five quarts of the Green Gage plum; these produced trees yielding fruit of every colour; and the White Gage, Red Gage, and Prince's Gage, now so well known, form part of the progeny of those plums; and there seems strong presumptive evidence to suppose that the Washington Plum was one of the same collection." Michael Floy gives a different history of the Washington. He states that he received the variety in 1818 from a Mr. Bolmar of New York who in turn had purchased his trees from a market woman in 1814. The purchased trees were produced as suckers from the roots of a Reine Claude tree which had been killed below the graft by lightning on the Delancey farm, now the Bowery, in New York City. 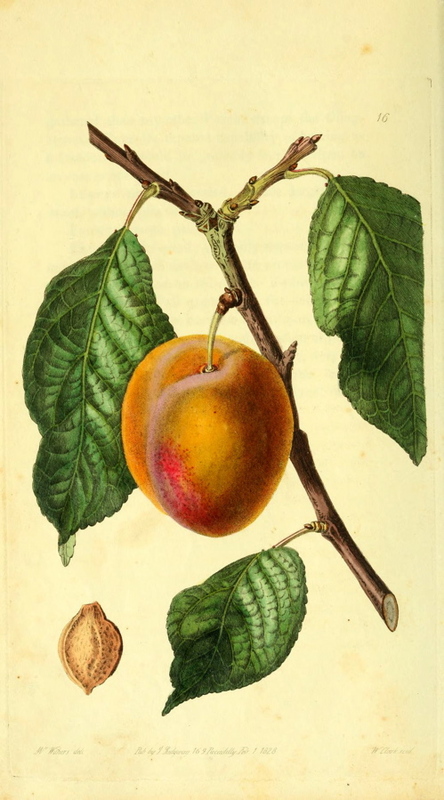 In 1819, a few of the trees, budded the previous year by Floy, were sent to England.’ [Plums of New York p.369]. Also figured in Le Jardin Fruitier du Muséum [JFM vol.2/1859]. Listed in Addenda to the 1857 catalogue as ‘Washington’ [Plum no.26/1857].